Criminal Justice: Mystery and Suspense on Television. 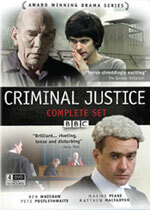 Criminal Justice is a BBC drama series written by Peter moffat that aired for two seasons of five episodes. Each season followed a single murder investigation from the perspective of the accused. The first season won a BAFTA Award for Best Drama Serial and for writer Peter Moffat.